The mullahs’ conundrum: Martyrdom or capitulation? A British Muslim, dismayed by his young son’s wish to become a pig rather than a doctor, has taken on a mission to effect the removal from television of Peppa Pig, the much-loved animal character whom he claims inspired his child’s unusual ambition, according to the Daily Mirror. Zayn Sheikh’s purported campaign includes a Facebook page called “Muslims against Peppa Pig“ that features a video – shared more than 9,000 times – explaining his reasons for pursuing the ban, according to the Daily Mirror. But the campaign turned out to be a hoax by Sheikh, who was later revealed as a YouTube comedian. “Some of you, right, might have seen this abominable creature before, right, this Peppa Pig. Haram pig,” Sheikh says in the video. “As Muslims it is very important that we do not eat meat of the pork,” he explains. 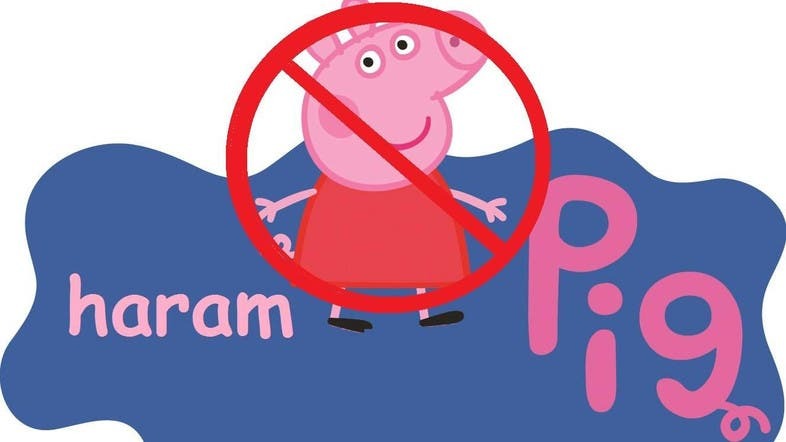 But Sheikh’s campaign to ban the pig is facing resistance by those who understood it to be real, with thousands of Peppa fans on Facebook determined to save the character from the chop.